Writing a college admissions essay can be stressful, but viewing samples can make the task easier to manage. While prospective students should submit original work, examples can provide inspiration and showcase what admissions officers are looking for. 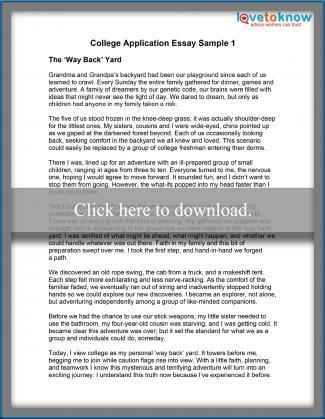 The Way Backyard is an anecdote from childhood to show how the applicant overcame an obstacle. Something to Say is a sample essay about an experience that caused profound personal growth. Both examples feature the description of a single event, express one or two personality traits of the author, and are engaging to read. If you want to download a copy of the sample, click on the image. Use the guide for Adobe printables for troubleshooting. Grandma and Grandpa's backyard had been our playground since each of us learned to crawl. Every Sunday the entire family gathered for dinner, games and adventure. A family of dreamers by our genetic code, our brains were filled with ideas that might never see the light of day. We dared to dream, but only as children had anyone in my family taken a risk. The five of us stood frozen in the knee-deep grass; it was actually shoulder-deep for the littlest ones. My sisters, cousins and I were wide-eyed, chins pointed up as we gaped at the darkened forest beyond. Each of us occasionally looking back, seeking comfort in the backyard we all knew and loved. This scenario could easily be replaced by a group of college freshman entering their dorms. There I was, lined up for an adventure with an ill-prepared group of small children, ranging in ages from three to ten. Everyone turned to me, the nervous one, hoping I would agree to move forward. It sounded fun, and I didn't want to stop them from going. However, the what-ifs popped into my head faster than I could count them. "We'll make sure to hold hands the whole time. We'll each carry a stick for protection and leave a trail of string to mark the path," said the five-year-old. There was no arguing with that kind of planning. We gathered our supplies and strength before announcing to the grown-ups we were headed to the 'way back' yard. I was terrified of what might lie ahead, what might happen, and whether we could handle whatever was out there. Faith in my family and this bit of preparation swept over me. I took the first step, and hand-in-hand we forged a path. We discovered an old rope swing, the cab from a truck, and a makeshift tent. Each step felt more exhilarating and less nerve-racking. As the comfort of the familiar faded, we eventually ran out of string and inadvertently stopped holding hands so we could explore our new discoveries. I became an explorer, not alone, but adventuring independently among a group of like-minded companions. Before we had the chance to use our stick weapons, my little sister needed to use the bathroom, my four-year-old cousin was starving, and I was getting cold. It became clear this adventure was over; but it set the standard for what we as a group and individuals could do, someday. Today, I view college as my personal 'way back' yard. It towers before me, begging me to join while caution flags rise into view. With a little faith, planning, and teamwork I know this mysterious and terrifying adventure will turn into an exciting journey. I understand this truth now because I've experienced it before. "Ms. Smith, please see me after class." The bell rang, and I sat frozen to my chair. I had never been asked to stay after class by a teacher. Not me, the straight-A student who had never even been near trouble. Mrs. Abraham clearly saw my fear as she walked over and took the seat next to me. "Ms. Smith, why don't you ever raise your hand to answer questions or give opinions in class?" "You are probably the smartest student in my class. Most of these other kids went to private, Catholic schools. They were raised with a certain set of beliefs. You weren't." "That's why." My reply was a weak whisper. "They know more than I do about religion." "Please hear what I am about to say." Mrs. Abraham paused to look me straight in the eye. "You have something to say, something that could help the other kids. I read your papers, don't forget. I know what is hiding in your brain, and it is important." That Friday morning in March of my junior year in high school set the stage for the rest of my life. I knew I was smart, empathetic and thoughtful. What I didn't know was the importance of my views. Mrs. Abraham was new that year. She didn't know me or my history. She knew what she saw, what she felt and what she heard. I have something to say today. Actually, I have a lot of things to say every day. My voice is important because it is unique. I think about things in a way no one else can because of my distinct upbringing and set of experiences. My words can educate, validate or inspire. They can be lost, but they can also be found. They're powerful to someone I may never see again, in a way I may never know. Although they can be misconstrued, misunderstood, and ignored, the risk is worth the reward. Thanks to the confidence and foresight of one person, I know the weight my words carry, and I am ready to share them with whoever might listen. These kinds of topics help college admissions officers get a better idea of the applicant's personality. The basic idea is to write an essay that showcases aspects of oneself that cannot be seen in other areas of the application. Think about moments in life that have shaped who you are. Consider who your mentors are, or people who have inspired you. While it is possible to find a book of college essays at the library, websites may offer a faster way to do research. Quint Careers has sample essays for admission to prestigious universities including Cornell, Harvard and Stanford. Accepted has four generic samples, each taking a different approach on the typical admissions question. SparkCollege has sample essays complete with the names of the students who wrote them and a copy of the essay question for each. Several are responses to nonstandard questions. Johns Hopkins University showcases actual essays used by current college students and features notes about why the essays were successful. College application essays are an important part of the application process. Most applicants will have a similar resume and transcript, but no one else has your personality and characteristics. Show off the unique person you are and what you have to offer the college with your personal essay. Use sample essays as inspiration, but be sure to express your unique experiences.